The conservation project at Legodimo reserve in Botswana has been developing rapidly. We now have a clear view of the Limpopo River thanks to our volunteers who spent a hard day’s work with their machetes. This means we can observe any wildlife from around the camp fire and gives curious animals the opportunity to investigate our camp. We have four regular visitors a genet, a porcupine, a bush buck and last but not least the camp’s pet kudu named Moses. Meanwhile back at camp the elephants had been around in force as there were trampled trees as far as you could see. We have come to the conclusion (which is backed up by what the Tswana people believe) that the elephants’ movements seem to be influenced by the position of the moon and we have discovered that if there is a full moon they come in and around our camp. Future developments include the building of an elephant hide close to one of the watering holes; this will enable us to conduct further detailed research into the amount/size and whereabouts of the reserve’s breeding herds. 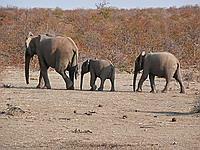 This data is essential in order to prevent the over culling of Botswana’s elephant population. We have now also completed the building of an elephant dam close to camp.